A hidden gem located a mere 30 minutes away from Sri Lanka's bustling capital city, Colombo and 20 minutes away from the Bandaranaike International Airport. The resort is a haven away from the hustle and bustle of everyday life. 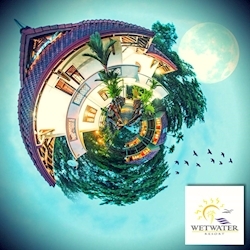 Despite its modern amenities, well trained & attentive staff and convenient location, Wet Water Resort is situated in the midst of an idyllic rural landscape of paddy fields, lakes and lush tropical greenery and as a result, your stay with us will be peace and tranquillity epitomized. Prepare to have your senses refreshed; to experience a true sanctuary, accented by cool breezes over the lake carrying with it the delicate scent of water lilies and the songs of the lowland birds.